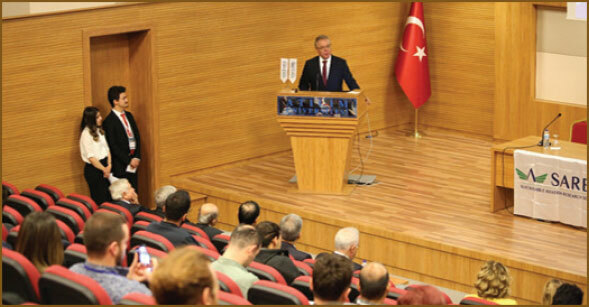 The workshop encompassing the main theme of “Success Stories in Turkish Aviation” was held in Ankara on 19-20 April 2018 and led by the SARES (Sustainable Aviation Research Society) and hosted by Atılım University. Prominent directors, scientists, researchers and engineers who served and contributed to Turkey in aviation as well as our crucial defense industry associations were invited to the Workshop and the event was realized with the contributions of Roketsan, Aselsan, TEI and TÜBİTAK Sage. Atılım University’s President Prof. Yıldırım Üçtuğ, Vice President Prof. Yılmaz Kaptan, SARES Society’s President Prof. Hikmet Karakoç and Atılım University Civil Aviation Academy Director Prof. Nafiz Alemdaroğlu delivered the opening remarks of the Workshop and Deputy General Director of the General Directorate of Civil Aviation Can Erel attended the Workshop as well as Metropolitan Municipality Mayor of Eskişehir and former President of the Anadolu University Prof. Yılmaz Büyükerşen, TAI’s former General Director, TSKGV’s former General Director and TAI Executive Board’s former President Mr. Saim Dilek, former Undersecretary for Defence Industries, CCN Holding Executive Board Member and General Manager Murad Bayar, Roketsan President Selçuk Yaşar, MyTechnic President of the Board Yavuz Çizmeci, Rt. Major General Fazıl Aydınmakine, Prof. Cahit Çıray, Prof. Nuri Saryal, Prof. Ahmet Şevket Üçer, Prof. Ünver Kaynak, on behalf of Aselsan Dr. Halidun Fildiş, TEI Design Engineering Director Ahmet Fındık, TÜBİTAK-Sage Business Development and Strategy Unit Manager Mr. Ahmet Yaşar Özen, TAI UAV Engineering Director Mr. Remzi Barlas, TAI UAV Engineering Structure and Aircraft Systems Manager Mr. Bülent Korkem participated in the Workshop as speakers and conveyed their experiences to participants. The establishment of the Turkish aircraft industry, past and present of our defense industry, developments in this area, transition from joint production to indigenous products and designs, the distance covered in civil aviation training activities, developments and achievements of our country’s defense and aviation projects, air vehicle design and prototype activities, maintenance and repair services, aircraft engine and missile development activities were examined at the Workshop and the experiences were shared with the younger generation.